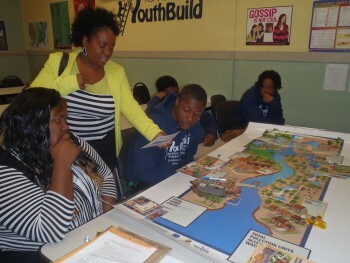 Angie Wills, YouthBuild program director, participates in a watershed activity with her students during one of the classroom training sessions led by the federation. River City Community Development Corporation in Elizabeth City works to improve the quality of life for people in Pasquotank County. Through its program, YouthBuild, they provide economically disadvantaged young adults between the ages of 16 and 24 with education and employment skills through opportunities for meaningful work in their communities. The federation works with YouthBuild on a year-round basis to break this barrier by engaging these at-risk youth in classroom lessons focused on environmental learning and organizing off-site field trips and outdoor restoration experiences. Working together, the goals of both organizations are met: The federation inspires future environmental stewards by getting them outside and involved while restoring the coast and the YouthBuild students gain knowledge, community service experience and training in valuable job skills. 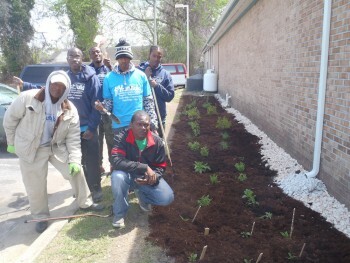 Some of the YouthBuild students and staff beside their recently installed rain garden. The federation teamed up with Mano al Hermano, a community-based nonprofit organization with a mission to empower Latino families through education and positive integration programs. With grant funding support from the Albemarle-Pamlico National Estuary Partnership, the federation supported Mano al Hermano’s summer literacy program. With the federation’s participation in the program, the books the students read during the summer program had a coastal learning theme. At the completion of the program, participants took a field trip to Jockey’s Ridge State Park where the students and their families explored the federation’s living shoreline project. With project partners from the North Carolina Aquariums and Tyrrell County Soil and Water district, the students learned about watersheds, our water planet and the importance of native species. The Blue Ribbon Commission on the Prevention of Youth Violence works with students who live in the Youth Enrichment Zone, which is an area with historically high crime rates in downtown Wilmington. Offering after school and summer programs, the commission works with students of all ages and partners with many organizations to develop fun and educational activities. The federation sets up field trips and educational programs for the students, many of whom have had little exposure to the coastal environment. In 2016, the federation was awarded a grant from the State Farm Youth Advisory Board, which will fund transportation for field trips, equipment and more through 2017. 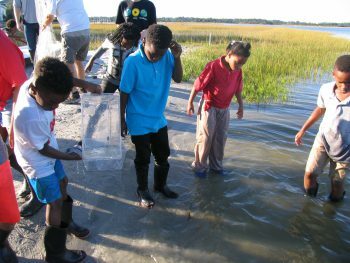 Students participating in the programs will get to explore marshes with federation staff, learn more about preventing stormwater runoff, engage in lessons about oysters and check out marine animals in touch tanks and in the wild. Juntos, which means “Together” in Spanish, is a group that works provide Latino 8th to 12th grade students and their parents with knowledge, skills and resources to keep youth engaged during high school and to encourage the students to continue their education in college. It started at Columbia High School, and one of its members, Daniel Salazar, interned with the federation and introduced staff to the group. The federation works with Juntos youth on hands-on science experiences and exposes them to natural resource career options they might not otherwise know about. Juntos members have accomplished many environmental improvement projects in Tyrrell County, including low impact development projects and participation in the Adopt a Highway Program. In 2015, the federation worked with Brunswick County Habitat for Humanity to install low-impact development techniques in its homes. Habitat for Humanity also partnered with the Brunswick County Cooperative Extension, Winding River Garden Club, Coastal Garden Club, UNC-Wilmington students and the U.S. Coast Guard. In new and existing homes, these groups installed environmentally-friendly landscaping and educated residents on the importance of preventing stormwater runoff.